Aloha SUP’ers and mahalo for dropping in with Blue Planet Surf. One of the most frequent inquiries we get at our shop in Honolulu, Hawaii is how does one determine what size and type of board is right for them. As avid water enthusiasts, our main objective at Blue Planet Surf is to provide sufficient info to potential paddlers, so that they are equipped with the best knowledge to make the best decision when buying their first or additional boards for their quiver. With the right knowledge, one can choose the ideal board to suit their surfing and paddling needs and ultimately have more fun on the water. Thank you to our customers for voting Blue Planet as Hawaii’s Best Stand Up Paddle Shop. Below you’ll find 12 images and graphs that will help you with the complex process of finding the right board(s) for you. As a surfer of many years (bodysurf, bodyboard, shortboard, longboard, and Stand Up Paddleboarding), I personally consider over 100 different variables when I’m choosing my own boards. For a first time SUP buyer, it would be excessive to consider so many variables, so we wanted to simplify the process for our customers. The boys at the shop and I were able to narrow a potential paddler’s focus down to 12 basic points which we use at our shop in Hawaii every day to help our customers find the perfect stand up paddle board for them. Keep in mind that surfing and paddling needs are very specific to the rider and their locale, so our images and graphs may not depict info that is 100% accurate for you and where you plan to use the board. If you have any questions about it contact Blue Planet Surf in Honolulu, Hawaii; or consult your nearest SUP/surf shop for more info. First and foremost, the paddler must consider what type of paddling they intend to do. By determining if an individual will be surfing, racing, cruising or doing a hybrid of those, they will have already narrowed their board selection down. In general, the shorter and smaller the board is, the more surfable and maneuverable it will be, while the longer and more streamlined the design is, the more efficiently the board will cover distance and the better the board will be for racing. 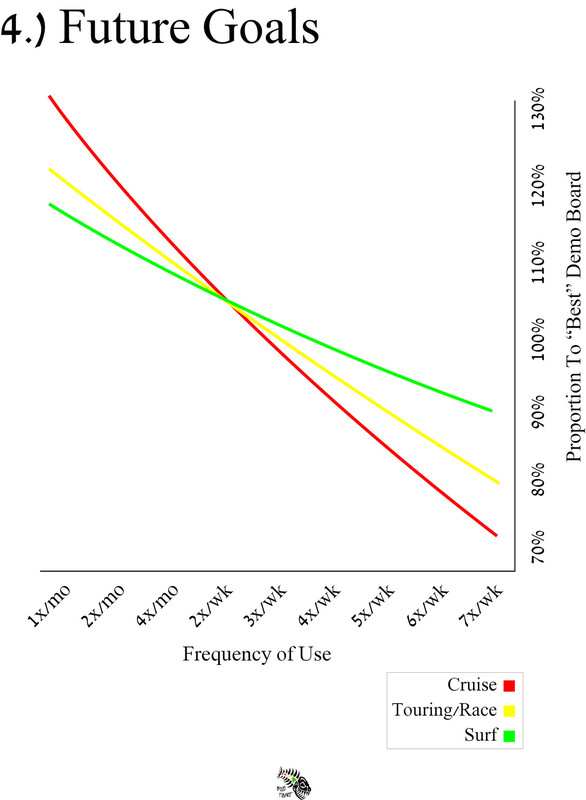 For cruising, one should consider boards that are in between those two spectrums, and skew their choice either shorter or longer depending on how they want their board to perform. Height and weight, along with skill level, are the next big factors an individual should pay close attention to. Because paddle boarding requires the board to be on top of the water at all times (different from shortboards where the board may be fully submerged when not planing on a wave), height and weight dictate the amount of floatation the board will need to offer. If there were twin brothers who grew up in the state of Hawaii and all variables for them are constant other than the fact that one spent the majority of his time in the library while the other spent the majority of his time on the soccer field, we can rationally conclude that the brother with an athletic background would probably do a little better the first time on an SUP than the brother who enjoyed the library. With that info, determine what type of paddler (6 choices) you could be most readily characterized as, determine your current weight and match up the recommended volume via the chart. It is important to account for the type of waters you will be paddling in as specific boards are designed for managing different types of environmental conditions. 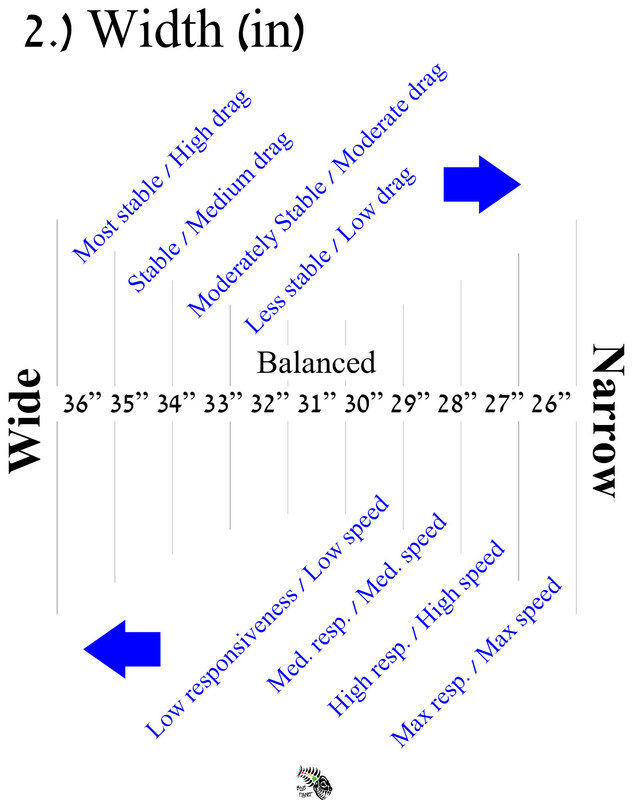 In general, the fuller the outline of the board, the more stable the board will be and the better it will be for cruising in calm conditions, whereas the more pointed the outline is, the more control and displacement the board will offer, making it ideal for windier or choppier conditions. Oceans, lakes, rivers, and other bodies of water offer many different environments for paddling so the main thing to consider is how frequently will you be in each of those conditions and choose board shapes and sizes that are most conducive to optimizing performance in those environments. By carefully considering those points, you may or may not want to choose a board that will allow you room for growth so you don’t progress out of a board too fast and need to buy another one. Keep in mind, there’s nothing wrong with owning multiple boards (quiver) to offer variable performance if conditions vary where you paddle or surf. The length of the board is measured from the tip of the nose to the tip of the tail. When it comes to the length, the basics to remember are that longer boards are faster while shorter boards are more maneuverable. 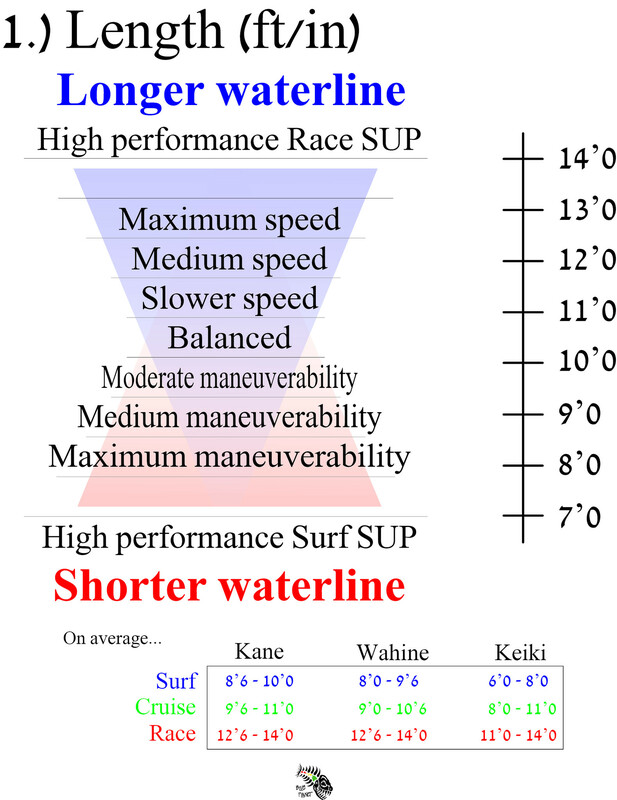 In general, surf SUPs are in the 8’-10’ range, cruise and recreational SUPs are in the 9’-11’ range, touring boards are in the 11’-12’ range and race boards are usually 12’ and longer. The width of your board is the most influential factor in the overall stability of the board. It is measured from the absolute widest point on the board and could be forward or back relative to the middle of the board from nose to tail. Like anything else in the SUP/surf world, if we gain something on one end, it’s because we’re giving up or sacrificing something on the other end. Although wider boards offer greater stability, they decrease the overall speed and responsiveness of the board due to the additional surface area. In general, performance surf and race SUPs are 26”-30”, intermediate SUPs are 29”-33”, and beginner boards or boards designed for taller and/or heavier individuals are usually 33” or wider. Of all the dimensions for one to be aware of, thickness is probably the least important because it can sometimes be a very misleading variable. Do not disregard the thickness variable all together, though, but pay close attention to volume (thickness) distribution from the nose to the tail and from the stringer (middle of board) out to the rails. The thickness, like width, is measured at the absolute thickest part of the board, which is usually by the stringer and belly of the board. If the board has a flat deck, the thickness is pulled farther out to the rails which will result in more floatation and stability. If the board has a convex deck, the thickness tapers out toward the rail and will usually offer less floatation but greater surf performance. 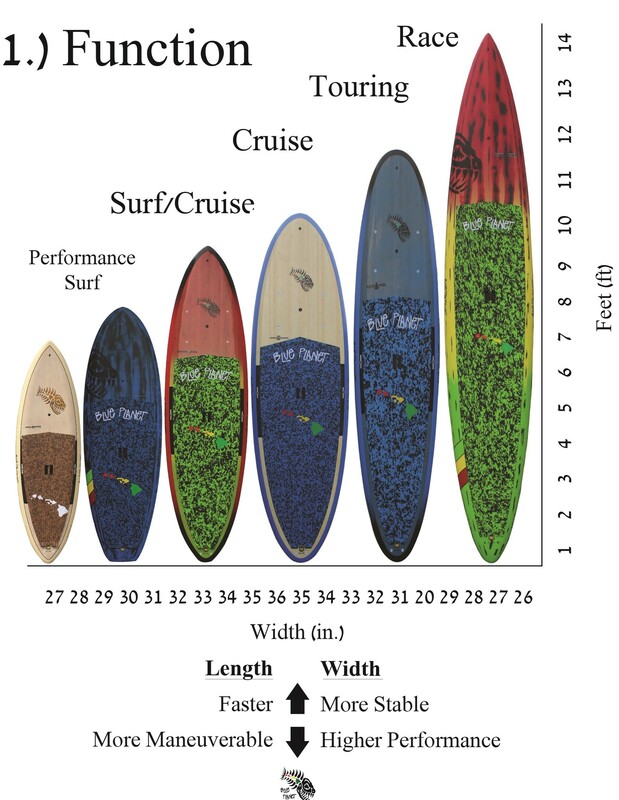 Most surf SUPs are between 3.5”-4.5” while most recreational, touring and race SUPs are between 4.5”-6”. Volume is a great factor to be aware of in the surf world and an even more important factor to be aware of in the SUP world. That being said, don’t rely on volume as the most influential determinant of what board is right for you as you must always assess boards from a holistic point of view, accounting for as many variables as possible. Unlike surfing where the speed on a wave generates planing and lift, SUPs should offer a good amount of floatation even when not moving. 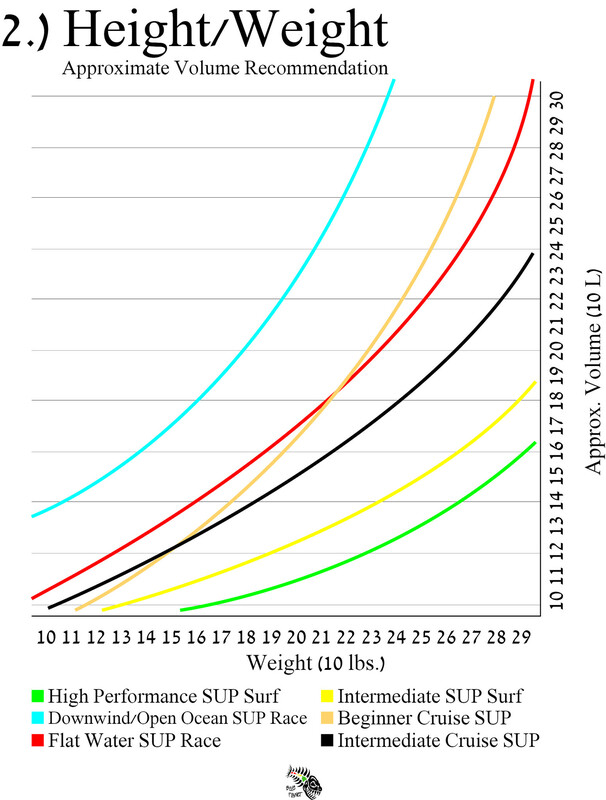 Height, weight, board function and paddler skill level are the four most important things to look at when figuring out the appropriate volume for your SUP. 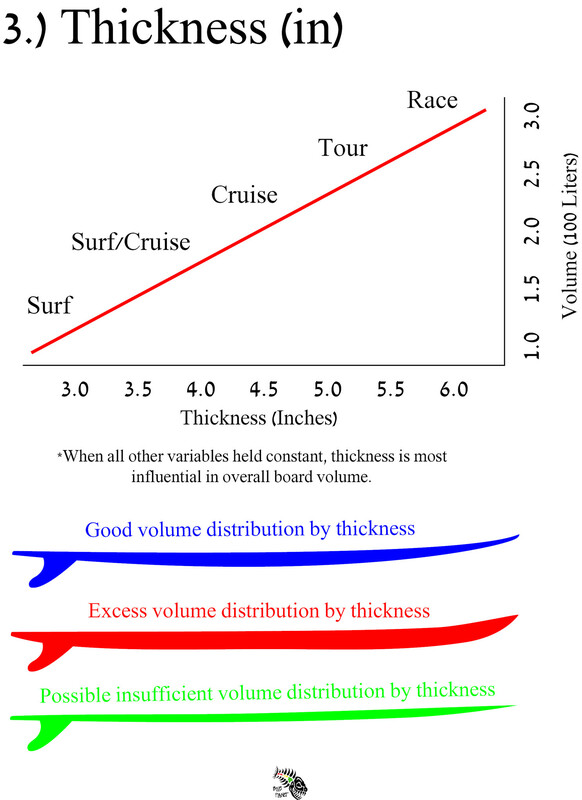 Choosing a board with too much volume may inhibit performance, especially in the surf, while choosing a board with too little volume will result in a general lack of floatation relative to the rider. 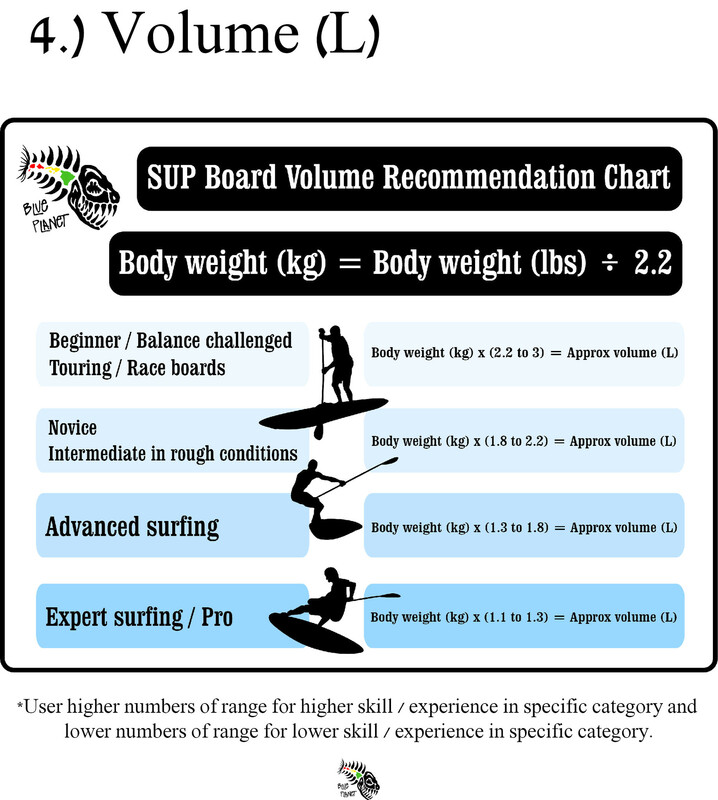 One of the best ways to figure out proper volume for you as a paddler is to utilize the Blue Planet SUP Board Volume Recommendation Chart. It uses 3 of the factors mentioned above and can give you a pretty solid idea of what volume you should consider with a simple mathematical calculation. The basics of the volume recommendation chart are to take your weight in kilograms and multiply that weight by a factor between 1.1 and 3. The lower the multiplying factor the more performance and surf oriented the board will be, whereas the higher the multiplying factor the easier or race oriented the board will be. Determine where you fall in the chart and utilize the appropriate multiplying factor for you. When it comes to the nose of your board, one of the easiest ways to simplify understanding the design and thus performance is by looking at the surface area. In general, you have pointed noses with less surface area (sometimes referred to as displacement hulls) and full noses with more surface area (sometimes referred to as planing hulls). With pointed noses you have increased maneuverability, increased displacement, increased speed, less drag and less stability. Fuller noses offer nose riding performance, better planing, increased stability, and increased drag. In the surf world, if you like maximum maneuverability from the tail and don’t need any nose riding capabilities, look for more pointed noses. In the recreational SUP and race world, pointed noses offer better displacement in calm and choppy conditions. Fuller noses allow for longboard style surfing with the ability to nose ride, and provide additional stability in calmer flat water conditions. On the downside, fuller noses are less than ideal for managing open ocean conditions, or waters with lots of texture and chop. The tail of your board has similar properties to the nose in the sense that surface area is the main consideration to be looking at. Fuller tails offer a better planing surface for increased glide and speed but have looser control and maneuverability, whereas more pinched in tails offer less planing surface for better control and tighter turning, especially in the pocket. For bigger wave high performance SUP surfing, looking for less surface area in the tail to contribute to more control in those steeper and hollower sections. 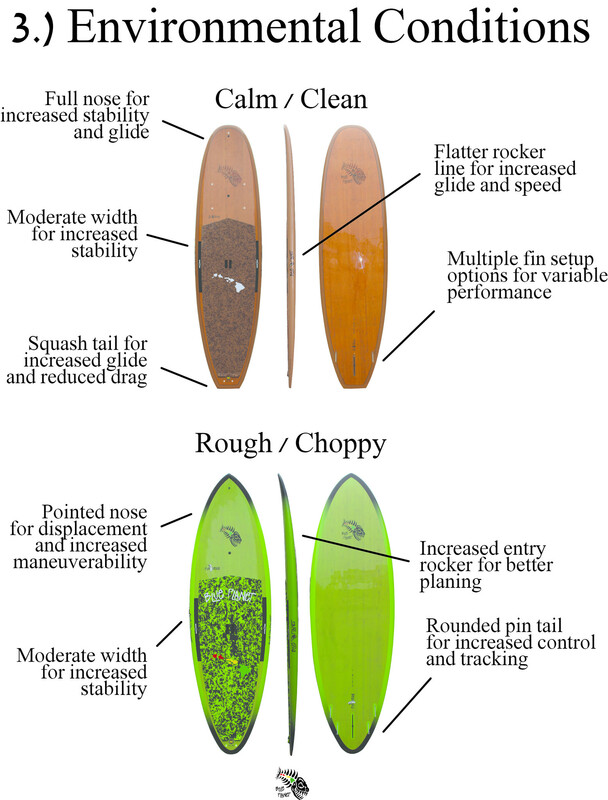 For small wave SUP surfing, choose slightly fuller tails to help generate and maintain speed with looser turning. In the flat water and race SUP world, choose tails with less surface area if you’re paddling in rougher conditions to provide additional control or choose tails with more surface area if you’re paddling in glassy, calm water conditions to increase planing surface and glide. The rail design of your board is influential in the stability and surfability of the board. There are an infinite numbers of ways to design a rail (like everything else in board design) when taking into account angles and transitions from the nose to the tail (soft rail to hard rail). To oversimplify it, you can look at the rail design in the standing area of the board (usually 1’-2’ in front and behind the handle) to determine what kind of performance the board was designed for. The thicker and boxier the rail is (more volume pulled out to the rails), the more stable the board will be and the better it will be for racing, touring and cruising. The thinner or more tapered off the rail is (less volume pulled out to the rails), the better the board will be for holding a rail in the face of the wave when surfing and controlling your turns. Thinner rails also allow for better control in rail to rail surfing and faster responsiveness on a wave. As surprising as it may sound, rocker line is one of the most important components of board design in the surf, SUP and race world. Coupled with the board’s outline, most shapers (especially in the high performance shortboard world) will tell you that rocker line is a make it or break it factor for board performance. 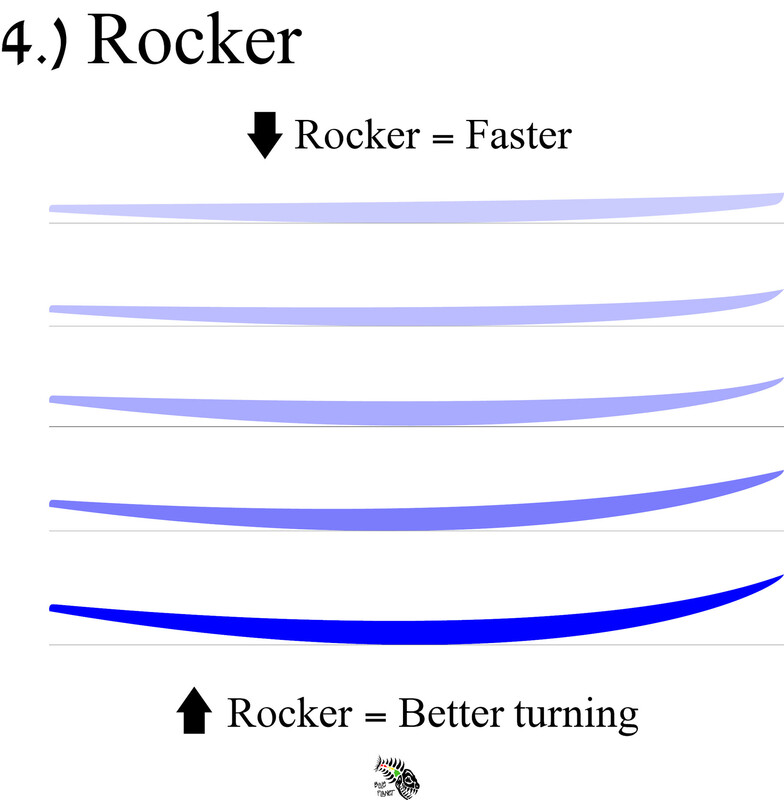 To oversimplify the rocker, flatter rockers mean more speed while increased rocker lines mean better turning in the surf or better management of open ocean conditions in SUP racing. When looking at the rocker for your first board, the best thing to consider is what type of conditions are you surfing or paddling in. Usually for higher performance surfing, you’ll want more exaggerated rocker lines, whereas flat water recreational paddlers and racers look for flatter rockers to maximize speed. Because we are blessed enough to be in the state of Hawaii, I personally own 4 alaias, 3 bodyboards, 22 shortboards, 3 longboards and 9 SUPs. Most people are shocked at the number of boards I’ve collected over the years, but the truth is I love having an excessive number of boards in my quiver to choose from (much to my girlfriend’s chagrin as they take up a lot of space). By having a diversified selection of equipment at my disposal, I can check the surf forecast and bring the best board of my quiver to have the most fun on any given day at any given break. The easiest way for the non-surfer to understand this insanity is to think of boards like golf clubs. If you’re on a par 5 hole, it wouldn’t make sense to use a putter to tee off, just as much as it wouldn’t make sense to use an iron to putt on the green. Every board (if shaped properly) is designed for a very specific and definitive purpose and having many different boards allows for one to have the best stand up paddle board to be able to play in many different and varied conditions to the best of their ability.